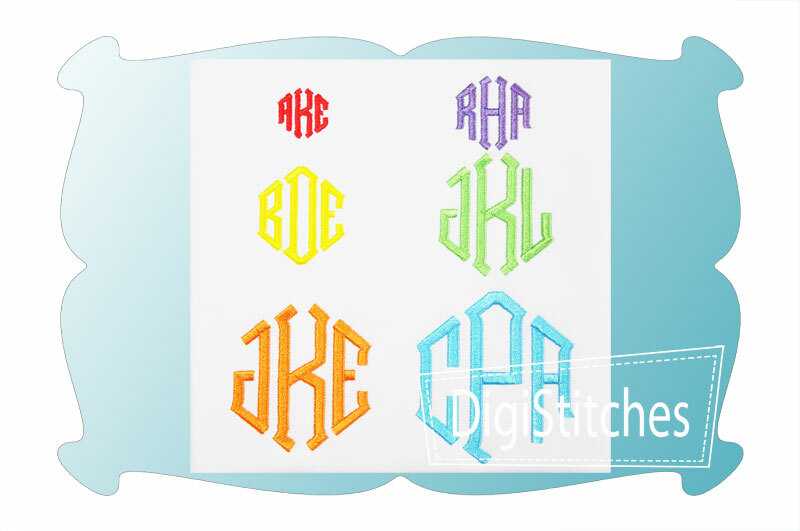 A beautiful point/ diamond monogram embroidery font in smaller sizes. 1 inch: .88 x 1.00 inches. SC: Avg: 969. Satin stitch. 1.50 inch: 1.32 x 1.50 inches. SC Avg: 1411. Satin stitch. 2.00 inch: 1.76 x 2.00 inches. SC: Avg: 1960. Satin stich. 2.50 inch: 2.20 x 2.50 inches. SC: Avg: 2533. Satin stitch. 3.00 inch 2.64 x 3.00 inches. SC: Avg: 3184. Satin stitch. 3.50 inch 3.07 x 3.50 inches. SC: Avg: 4456. Satin stitch.